Refugees have become a thorny problem in Indonesia, with more than 10,000 of them currently living there. This is the story of one 19 year old refugee in Indonesia. “All I wish for is to live in a peaceful country, anywhere will do,” The 19 year old Afghani boy sitting across from me says. With a face resembling a Southeast Asian, Ali Ahmad Jafari has been a refugee since the day he was born. His parents left Afghanistan before he was born, seeking asylum in neighboring Pakistan. Having been unable to yet obtain Pakistani nationality, they are still registered as refugees. Even though he was born in this country, he’s now a 19 year old, struggling in Indonesia. Ali is a Shia Muslim, from the Hazara tribe. The Hazara’s have both Turkic and Mongol blood with the majority living along the Afghani-Pakistani border. For years they have faced discrimination as well as brutal massacres by the Taliban. Ali’s parent’s passed away when he was still very young and was raised by his maternal aunt. His life in Pakistan has been anything but peaceful. As he describes to me “At any time, any place, a bomb can go off”. The Hazara’s are a target for attacks here with every passing car or bus a potential bomb, ready to go off at any time. Because of this they have to be very careful in everything they do, living in daily fear for their life. The Pakistani media has reported that Hazaras living in Pakistan have been racially persecuted in recent years and have become a target for bomb attacks. Since 1999, at least 1400 Hazaras have been killed. Searching for a better life, Ali’s cousin left for Australia in 2008. He was later able to obtain asylum and citizenship from the Australian government. With that in mind, and while still under the care of his aunt, more than two years ago a 17 year old Ali decided to follow his cousin’s footsteps and seek citizenship in Australia. Ali tells us his aunt paid smugglers to help him leave. He first flew from Pakistan to Cambodia, and from there boarded a flight for Thailand. After that, he took a boat to Malaysia, where he stayed for more than a few days. Then one day, late at night, he boarded a boat bound for Indonesia. “The only thing I had with me was my backpack, which the smugglers in Cambodia stole from me” Ali says. By the time he arrived in Indonesia, he had nothing but his passport and the clothes he was wearing. Immediately after arriving in Indonesia, Ali headed to the United Nations office and applied for refugee status. After a few weeks of interviews, the investigation ended and he was finally granted refugee status. However, Indonesia is not a signatory to the United Nations ‘Convention Relating to the Status of Refugees’. Because of this, refugees are allowed only to reside in Indonesia, while they wait for The UN to place them in another country. On top of that, refugees residing in Indonesia are not allowed to work, get married nor are they allowed to attend school. During his interviews, Ali was told by the UN workers that he’s at the beginning of a very long wait. He never thought it would last this long however, with 30 months already having gone by. Ali has an ‘Refugee ID’ similar in size to a Taiwanese ID card. He tells me that every year he goes to the UN office to renew his documents. Starting more than two years ago however, other than during his interview, he has been unable to meet with any UN officials. Because of this, he has no clue about the progress of his placement in another country. All he knows, is that he will continue to wait, day after day. 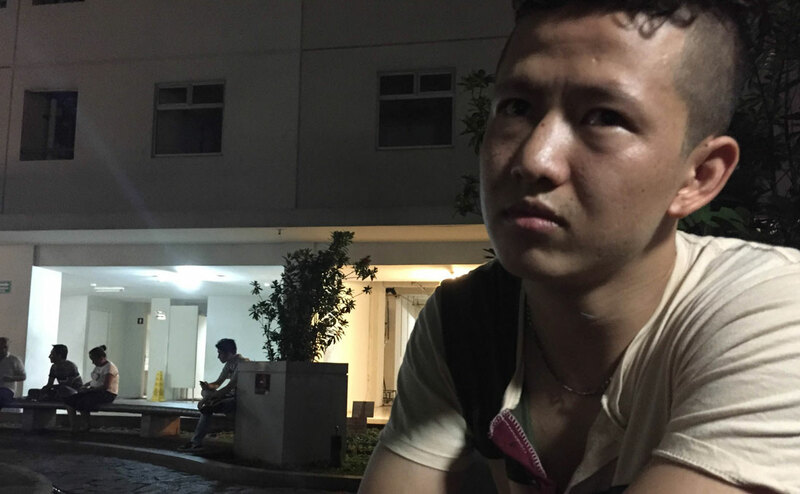 For now Ali, and his fellow Hazaras who have also obtained refugee status, have rented a room in an apartment building in Jakarta. He helps out with cleaning and other small tasks which helps lower the rent. Because he can’t work, all of Ali’s living expenses are paid entirely by his cousin in Australia. Ali sighs when he says “When I see the Indonesian students going to school, I really envy them”. Speaking in fluent English, he tells me that every time he sees the students in their uniforms it reminds him of his days in school. When he was in Pakistan, Ali attended a school setup by an NGO. The school was only able to offer classes up to grade 5. After graduating from the fifth grade, Ali was unable to continue in his studies. He learned English at a separate language school. He tells me that his dream as a young boy was to become a computer engineer, but at this point all his dreams have gone out the window and all he can hope for is to be placed in a safe country. Getting through each day is enough for him, with school and work long forgotten. When I think about when I was 19 years old living in Taiwan, I was a freshman at university, full of imagination! But here is Ali, living a hard life in Indonesia, his dreams having already been crushed. Ali is just one of more than 10,000 refugees living in Indonesia. According to the statistics, there are currently 13500 refugees waiting for placement in Indonesia. In addition, because Australia has implemented a more restrictive refugee policy, they aren’t taking in any more refugees. Due to this, the task of resettling refugees has become even more difficult. So Ali continues to wait, with no one able to give him an answer. Zachary Tsung-Hsien Lee is a Taiwanese Journalist based in Indonesia.